so cute! vector is goregous and wallpaper is love! with cute vector and wallpaper~! I like wallpapers with this kind of style too~ :nya: Oh yea, your laptop is widescreen right? XD So cool! I luv Vampire Knight and your wallie is soo prettie! Good job as usually! I LOVE her hair! It's so well done! *gasp! I Love this Wallpaper! Its really cute (hehe!) Yuuki's hair is amazing! The colors are perfect, and making them in different layers! It has this cute feeling whenever i see it!) I love how you colored the eyes! I would also like to compliment on the letters...it makes me think of the collage project i use to do in primary! 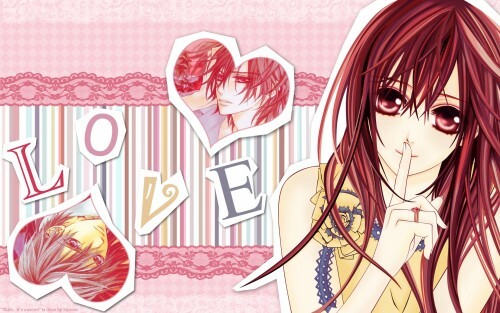 And i love how you included Zero and Kaname! Really, keep up the good work! This is a really unique wallpaper! i'm loving your vector works, the hair is fabulous but the eyes are really really gorgeous, I can't stop staring. Stunning vectoring. Looks really great! Anyway, can you join this club: ? This is very cute, really cute! too animeish for my desktop though lol. But it is wonderful, great work sinever.